Mosaic Transit Group, the company selected by Metrolinx and Infrastructure Ontario to design, build, finance and maintain the Finch West Light Rail Transit Project (The Finch West LRT), is completing a Class Environmental Study for the Highway 400 Bridge Rehabilitation at Finch Avenue using a Rapid Bridge Replacement method. The objective of the study is to provide opportunities for stakeholders and members of the public to provide feed-back of the Highway 400 Bridge Rehabilitation using a Rapid Bridge Replacement method. 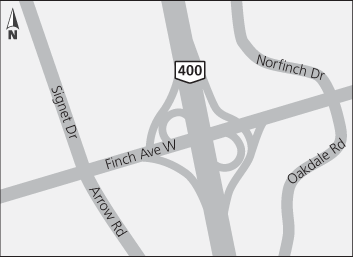 Finch West LRT line will pass below the existing Highway 400 Bridge at Finch Avenue West. To maximize efficiency and reduce impacts on motorists, the Province of Ontario (province) has incorporated the bridge’s rehabilitation into the Finch West LRT Project. Construction of the Finch West LRT line has accelerated the province’s plan to rehabilitate the Highway 400 Bridge. A Rapid Bridge Replacement method is an innovative bridge construction method that expedites construction while reducing overall impacts to the public. The method involves building new bridge spans adjacent to the existing highway in staging yards, thereby avoiding construction staging and highway lane closures for extended periods. Once new bridge spans are constructed, they will be installed in each traffic direction over two separate weekends to minimize traffic impacts. The Highway 400 bridge construction is planned to begin in 2019, with the replacements of each section of the bridge installed using a Rapid Bridge Replacement method in Spring/Summer of 2020. Motorists travelling along Highway 400 will be affected during the weekends the Highway 400 northbound and southbound lanes are each closed for installation of the new bridge. For each of the weekend closures, Mosaic Transit Group will communicate in advance to the public using multiple sources, including but not limited to print advertisement, media relations, road signage, Variable Message Signs, static signs, traffic alerts, public notices, social media platforms and the Project website. Mosaic Transit Group will conduct a traffic study to support re-timing of traffic lights in signalized intersections on adjacent arterial roads. Using a Rapid Bridge Replacement method to replace the Highway 400 Bridge will have less traffic impacts when compared to a traditional method, which would last for many months and cause long duration of lane reductions and lane changes. This EA study was initiated as a Group ‘B’ project in accordance with the Class Environmental Assessment for Provincial Transportation Facilities (2000) (MTO’s Class EA). Public consultation of the Highway 400 Bridge included notification of external agencies, stakeholders, and the public at the start of the study using a Notice of Study Commencement that was placed in English and French newspapers and on Mosaic Transit Group’s website at www.mosaictransit.com. A total of two Public Information Centres (PICs) were held on Monday, December 10, 2018 and Wednesday, December 12, 2018 to provide members of the public with opportunities to review and provide feedback about the Rapid Bridge Replacement method, and proposed construction staging and traffic management plans. Additionally, Mosaic Transit Group met with key stakeholders to provide information and receive feed-back. Information boards of the materials presented to members of the public and stakeholders as well as a feedback form are posted to www.mosaictransit.com. Based on information collected and comments received during the consultation process, it has been determined this project will not result in any significant adverse environmental effects. Therefore, it is eligible to be stepped down from a Group ‘B’ to a Group ‘C’ project. This public notice will provide a 30-day review period where affected parties may request the project remain a Group ‘B’ classification. While Mosaic Transit Group will continue to engage and consult with stakeholders throughout the remainder of the EA process. Comments related to the proposed step-down must be submitted in writing to the addresses below by April 8, 2019. If no objections are received by April 8, 2019, the project will be stepped down to a Group ‘C’ classification and there will be no further opportunities to request a higher level of assessment (i.e. an Individual Environmental Assessment under the Ontario Environmental Assessment Act).